I'm getting through the photo backlog still - now in 2014! I've actually already processed some of the larger sets from last year because I used the images for my Master's degree, but there's some new stuff to get through as well. This first set of photos is from a Digimakers event that took place in March 2014. 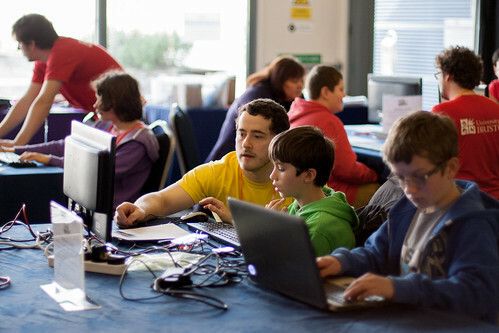 Digimakers is a series of workshops that aims to get more people (particularly children) using technology to make exciting things. To find out a bit more, take a look at this video package I made about the workshops for a piece of coursework. And now on to the photos! This picture is the one I used as the main image for my final master's project. I took a lot of close up shots at the two Digimakers events I attended, but this one shows a bit more of what is going on. These two boys are being taught to use Raspberry Pi computers. Raspis are small and cheap and you can use them to do all sorts of things, so they work well for computing outreach. Students from the Bristol chapter of Robogals, an organisation that does STEM (Science, Technology, Engineering and Maths) outreach mainly aimed at young women, also run workshops as part of Digimakers. They use LEGO Mindstorms robots. The robots can be programmed in different ways. Robogals run robot dance-off workshops for more advanced participants. 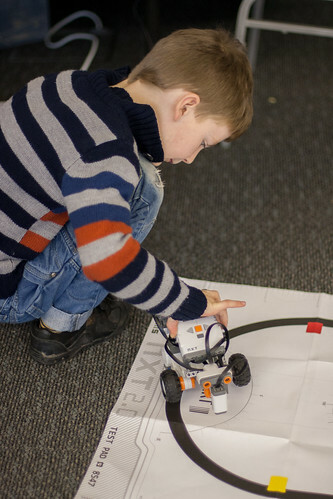 A more basic way to program the robots is to get them to follow a track, which is what the child in this photo has done. You can see the full set of photos from this event on my Flickr page or find out more about computing outreach in Bristol at the online feature I created. 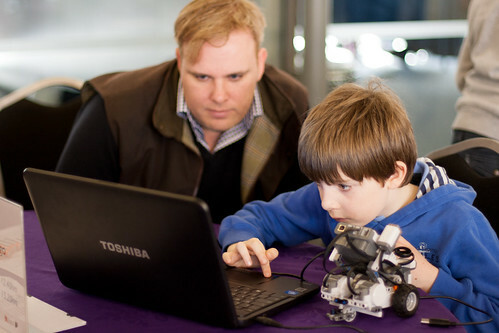 The next Digimakers event is on 28 February, so go sign up and have a go at something new! You don't need to be accompanied by a child to take part. I've been going through my (very large) photo backlog and I've nearly finished 2013...yes, I've got a ways to go. When I was doing my master's I did a piece on ways people improve their mental wellbeing. As part of that, I interviewed the lovely Sara, who volunteers at Bristol Zoo Gardens. 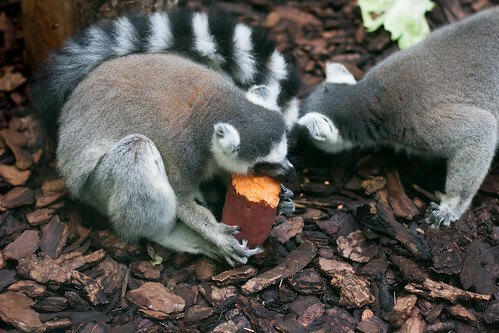 Volunteering is a great way to get back into doing work when you may have had a bit of a break, and if you help out at the zoo you can get in for free, which is quite handy, especially in the summer! We decided to do the interview at the zoo - managed to find a place with ducks for some nice atmospheric noise - and then wandered around looking at the animals. 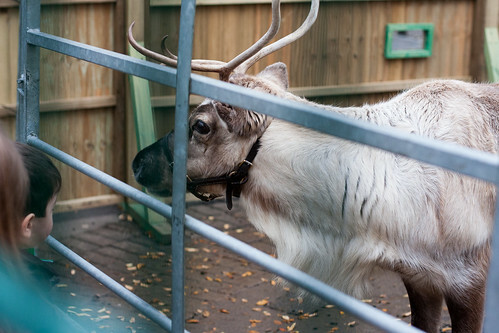 It was pretty close to Christmas so they had some reindeer visiting, which was pretty exciting! There were lots of small children getting very excited so it was a bit tricky to get a good shot so I thought I'd frame the picture with the kids. Sara volunteers in the lemur walkthrough so we spent a bit of time watching them. This little guy was chowing down on a sweet potato, while his buddies had cucumbers and bananas and all sorts of other goodies. I seem to have quite a few photos of capybaras from this visit to the zoo, so here is one just chilling out. 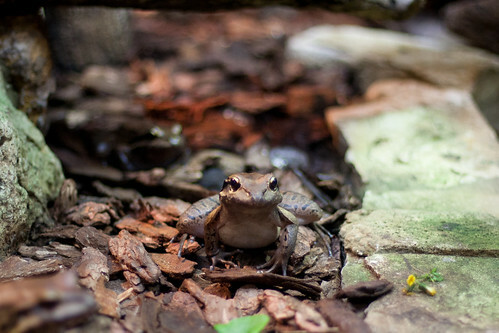 And finally, we found this rather happy frog. So pleased! It can be quite tricky to get shots of animals in enclosures as there's stuff like glass or netting in the way, so I'm happy with how this turned out. Check out the rest of the zoo collection or have a look at my Flickr photostream for more pictures.